This week's review is of the Skin79 White Reviving Skin Radiance Cream. It's part of a line of whitening products, but I was reluctant to invest in an entire line when there were so few reviews for the products and because I wasn't sure I wanted or needed them all. That's right. Whitening. It does not mean what you think it means. It has nothing to do with bleaching. I'll get into the details in the full review, but the short version is that it fades hyperpigmentation such as acne scars, age spots, and sun damage. Skin79 (official site) is fairly well-known to western audiences as the makers of the ever-popular Hot Pink BB cream which has become known as a good 'starter' BB cream but sadly with notoriety comes imitation and Skin79 is one of the most-faked BB cream brands out there. They are lesser-known to westerners as a skincare line, which is a shame because if the cutesy teen styling of Tonymoly or Holika Holika isn't your style, Skin79 is a great option for mid-range skincare from an established, mature-friendly brand. Texture: Midway between a lotion and a cream, absorbs easily. Leaves a subtle luminous finish so watch out for Shiny Face if you are layering other reflective products over it. Scent: Mildly fragranced, with a soft floral scent which fades quickly after application. Packaging: The jar feels and looks luxurious despite being plastic; it has a frosted clear exterior and a rounded opaque white interior to block light from damaging the product, which is a nice touch. It does not come with a spatula so you will want one of your own. Availability: I purchased mine from prettyandcute.com, also available from Skin79's official site and various places online, but keep in mind that Skin79 products are famous for being targets for fakes, so be extra cautious when purchasing their products online. Repurchase: Yes, in fact I have already purchased this for my mother-in-law, who is looking for something to combat her age spots. First, what kind of pale person is crazy enough to want to be paler? Aren't we supposed to be tanned, that fine layer of sun-damaged skin that we describe as being healthy, glowing, radiant? As I said in my post on why I started this blog, being introduced to Asian skincare was a godsend for my sun-ravaged skin, because as much as western beauty is preoccupied with being more tanned, Asian beauty is as preoccupied with preventing it. Not only are almost all products laced with sun protection, they often contain whitening ingredients to reverse sun damage. I admit it, I was initially shy of anything "whitening" because like most westerners, I was suspicious of anything for lightening the skin. Coming from an area of Canada with a 40% Asian population, I was already aware of a preference for lighter skin in a lot of Asian countries. (Here's PBunnieP's explanation for those unfamiliar with it.) In my student days I lived with a Chinese friend and her family, which introduced me to amazing food, mahjong, and some very strong opinions about female beauty. However, as I read more on "whitening" and what it meant in Korean skincare terms, I learned it's meant to break up deposits of melanin in the skin due to damage. That means hyperpigmentation from scars and especially acne (which I desperately needed as my skin purged 4 years of grime), age spots, and sun damage. I didn't want to bleach my skin, I just wanted to undo all the sun damage and get rid of my visible acne more quickly. I also needed something heavier than my Holika Holika Water March Moisture Full Cream for fall/winter. As always, I asked the Pretty&Cute girls what they recommended for reversing sun damage, and they recommended the Skin79 White Reviving Skin Radiance products as being specifically designed for just that. Not going to lie, I found the solution vs emulsion vs cream vs softener vs serum confusing as hell, so that meant: RESEARCH TIME! Unfortunately, like 99% of the Asian skincare products I research, reviews are thin and are usually just shills for a particular retailer. I needed a winter moisturizer, so I went with the cream. It's surprisingly not as heavy as I expected, and absorbs quickly into the skin. It's nicely moisturizing but it does leave a soft glow on the skin, so I avoid applying it thickly in my t-zone during the day (I'm more generous with it at night) to avoid excess oil/too many layers of reflective particles on my forehead once I put on BB cream. I find it absorbs better by patting on the skin rather than smoothing it on. And lastly, does it work? Yes! It faded my tan, my sun spots, and my acne scars beautifully. It gave my skin back the luminous, translucent quality it had before I moved here, although after two months of usage it hasn't quite faded me back to the colour I was before. I have been avoiding my t-zone to prevent Shiny Face so I think I might step it up and give the Solution a go now that I know it won't bleach my skin off. It's also a beautiful moisturizer outside of the whitening effect, and the thin cream texture is perfect for my combination skin as it moisturizes it nicely without crossing the line into greasy territory. Despite the cream texture, it did not cause breakouts, and it sinks in quickly enough that I can wear it under makeup. The only negative is I only have a tiny amount left! I have hyperpigmentation on my upper lip from birth control pills and will be ordering this IMMEDIATELY. Loving your reviews, even if they are costing me money! :P BTW, the Liole BB cream was great-today was my first day wearing it and it blended beautifully and looked good all day long. I will warn you that it takes a while for the effect to be noticeable, I had used about half the jar before I noticed an obvious difference, so be patient. On the other hand, if it had worked too quickly I would have been scared! If you get it from prettyandcute, use their happyholiday coupon code for 15% off right now. Awesome, thanks for the code! I was planning to order from them-their stuff ships crazy fast and I don't want to worry about fakes. hi,i am 18 years old.is it suitable for teenagers like me? my face is getting dull. i also want to reduce acne scars on my face. I am not a professional of course, so I can only give an opinion based off my personal experience, but I found this cream to be very gentle despite being effective. I think it would be suitable for anyone who is looking to lighten acne scars/hyperpigmentation, although you may find it too heavy if you happen to have very oily skin. The luminous particles in this cream will definitely brighten your skin, but your skin's dullness will also be due in part to how you are exfoliating. I'd recommend using a very gentle exfoliation if you have this cream as part of your skin routine (I use a Clarisonic brush every other day) and avoid harsh scrubs as I have no idea how they would interact with the whitening ingredients. Glad to hear that the samples worked out and you've moved up to a full size! Have you started to wonder yet "whatever did [you] do before BB cream?" Effective multi function products are so amazing I can't ever see myself going back to a foundation. Please keep me updated on how you find the White Reviving cream! I know my mother-in-law loves hers and she's barely had it two weeks. yay thank you for reviewing this! Hello! Thank you for such an informative full review. I just came across your water march holika holika review, and I just have to read everything else. My mom has a bunch of sun damage around her cheek areas. She has been searching for so many products to lighten it or to fade it away pretty much. After reading so many praise about this product, I have a question. Does this product only works if you continue to use it? or in another word, once you see it all fade away and stop using it.. will your skin be back to the original darkened skin as before? If your mom is experiencing sun damage, she does have several options for lightening the existing damage. Niacinamide (which is in this cream) is one of them, Vitamin C serum is another (considered to be one of the most potent options), and also an AHA (Alpha Hydroxy Acid) which is a chemical exfoliant that dissolves the outer layer of dead skin. AHAs also help with rough skin texture, fine lines, and sun damage- but be warned, when you use an AHA, your skin will become photosensitive for up to 7 days after use, so a very strong sunscreen is a must if you use one. You can actually make sun damage worse by using an AHA without proper sunscreen, so look for SPF50/PA+++ (or PA++++ if you can find it) and reapply as directed. Japanese sunscreens are famous for being both pleasant to wear and also very potent; you can check out ratzillacosme's site for recommendations, reviews, and ingredients. So, to answer your question, does stopping use of this cream cause the sun damage to come back? Well, I personally found that my skin darkened when I stopped using it but that's because I live in a very, very sunny area and was constantly being bombarded with new sun damage. If I don't use whitening (as in brightening/reversing sun damage and post-inflammatory hyperpigmentation from acne) my skin does get darker but that's because new damage is being added without anything to undo it. So whitening products will help fade old damage, but they won't prevent new damage. So your best bet is to prevent new damage (sunscreen) while fading the old damage (niacinamide, vit C, AHA, etc) and keep in mind that sun damage is often lurking very far below the surface, so you may find that sun spots 'surface' from the skin for a long time before they're all gone. I learnt about this product from you years ago, some time after you posted this review. After a long but intermittent search for the cream I give up and I am coming back to the source. Living in central Europe I just can't lay my hands on it. Mind you, I wouldn't call myself a skilled online buyer, therefore I sort of hope I just missed a good skincare website where this product might be currently available. Could you please give me an updated recommendation where to purchase this cream online? 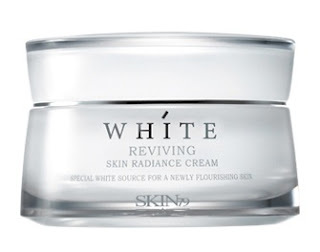 Surely the White Reviving Skin Radiance line is not discontinued, is it?